After a months-long nomination period, we are honored to announce that the five winners of the inaugural Kindness Is Powerful Awards have been named. The Kindness Is Powerful Awards are granted to individuals doing heroes' work on a daily basis without regular recognition or praise on behalf of animals in the rescue world. Nominees were submitted from Victoria's followers around the world, with winners receiving public recognition via Victoria Stilwell Positively media platforms as well as a donation in their name to a registered animal charity organization of their choosing. 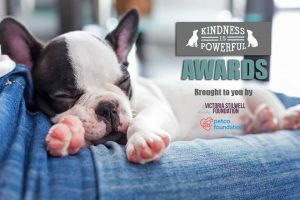 The Kindness Is Powerful Awards are a joint initiative between the Victoria Stilwell Foundation and the Petco Foundation. Rebecca founded Draft Gratitude in 2014 to save draft horses from slaughter and give them a second chance. Rebecca demonstrates her love and caring of these giant horses -- that have been loyal and hardworking all their lives doing farm work -- by saving and nursing neglected horses to either be adopted out to a loving home, or to stay at the 23-acre farm in sanctuary. Rescue and rehabilitate unwanted draft horses. Pair adoptable draft horses with approved homes. Educate our community on draft horse care, history, and potential. Depend on the support of the community to fund our life saving work. From Amy's nominator: "I know a lot of people in the animal rescue community, but I have yet to meet anyone who exceeds or even approaches Amy's level of drive in helping animals, especially dogs. She will, without hesitation, take on the most wretched cases, clean them up, get them spayed or neutered, and get them healthy, which unfortunately more often than not, involves treating for heartworms. "Amy keeps the dogs with foster parents (I am one), takes care of them until they are placed in a forever home, and continues by following up with adopters throughout the dog's life. Lest you think she only cares for animals, she will not hesitate to help a person in need, once carrying a person in a diabetic coma out of the park. Had she not done so, that person otherwise would have very likely died since no one else was in the park and it was turning dark." Rudy volunteers with Tyson's Chance Animal Foundation and his dedication to the dogs is nothing short of amazing. Rudy makes the 60 mile round trip 6 days a week to walk and socialize 20+ dogs. His kindness, love and patience with the often long term and special needs residents is an inspiration and makes him an integral part of the success of Tyson's program. Rudy is so loved by the dogs they know when he has arrived on the premises before he ever enters the building, knowing "Rudy in the house" means a car ride and a romp at the park. Rudy is an inspiration to everyone in our organization and in the local rescue community! Pam has stepped up for animals in virtually every arena that you can imagine. She has volunteered at animal rescues, protested outside of pet stores selling puppy mill dogs, and brought multiple rescue dogs into her own home. While she slowly rehabilitated Lil Olive, a badly abused Italian greyhound, she expanded her reach into the social media sphere, developing a Facebook page and persona that would attract more than 42,000 followers. Many of those followers — members of what Pam calls her “pack family” — have gotten their first taste of animal-welfare activism via her work. Pam's passion for animals and her desire to end puppy mills inspires me everyday. She is also extremely humble about the difference that she makes and cites her beloved puppy mill survivors as her inspiration. DeLinda is an amazing person. She works tirelessly to not only raise awareness of the need to rescue animals, she gives her time to volunteer for shelters and animals in need. She is a powerful voice against animal cruelty and is an advocate for humane training for all animals. The world is a better place for animals because DeLinda is here to fight for them. Congratulations to all of these worthy award winners!